City staff, when asked by City Council to build protected bike lanes on Harbord, Hoskin and Wellesley, had originally responded with a bidirectional bike lane for Harbord and Hoskin. It was a compromise that would allow businesses to keep some on-street parking between Spadina and Bathurst. But after studying they've decided that the bidirectional leads to too much delay for all traffic users. So instead they're coming back with a stripped down option that is going to be just paint with no protection at all. Luckily they got the TTC to agree to lane widths similar to those on Wellesley otherwise it would have been even worse. ...the City completed a comprehensive traffic study to measure the effects of bi-directional cycle tracks operations at signalized and un-signalized intersections. This study showed it would not be possible to safely accommodate bi-directional separated bike lanes, without unacceptable delays to all road users. 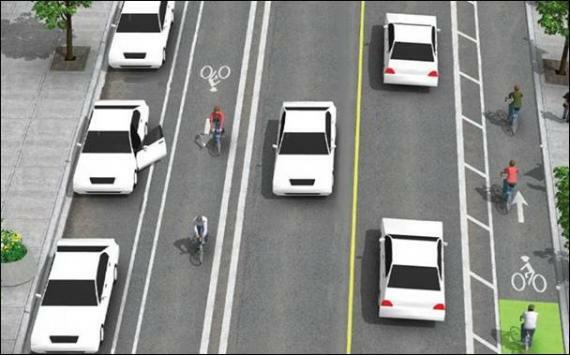 I would have preferred the City to actually do a pilot project of a bi-directional bike lane. A computer model is a very poor substitute for the real thing and can't possibly capture all the possible tweaks or substitute for actual safety data. In fact, it is difficult to establish safety conclusions with even actual injury data. I can imagine a model would be quite poor in predictive powers. Note that the City didn't say that bi-directional is "unsafe". Any infrastructure must be studied relative to other options including the status quo. Bidirectional works elsewhere, such as Montreal. It's just that the City was unwilling to accept the tradeoff of delays for a bidirectional bike lane. There are not even plastic bollards, though staff do suggest that it might be possible for the side without car parking (bollards would otherwise interfere with cars existing). But on Hoskin (east side of Spadina) the road is wider and there's room to put the bike lane between the curb and the parking. This is the preferred arrangement and is how saner cities like Copenhagen do it. The TTC doesn't want the parked cars to be too close to their buses. The mirrors of the buses will overhang the lane widths. I guess the TTC would rather that cyclists' heads serve as a buffer. The City is unwilling to either force this option on the TTC or to take out the parking in the narrow sections so that there is enough room for this protection. Toronto already has many bike lanes right next to parked cars, so it may seem unimportant that Harbord also have the same setup. It does seem that there is a bit of buffer to keep cyclists away from opening car doors. But research has shown that a bike lane next to parked cars is not as safe as a major road with zero on-street parking at all. In short, on-street car parking poses a danger to cyclists and the City is unwilling to take measures to protect cyclists even on prime cycling routes like Harbord. This is what I propose for Harbord: let the TTC "suffer". There is room for the buses and they can just drive more slowly. It's just Harbord, not one of the major transit routes. I made it on streetmix. Just look at all that added space! And I bet without cars getting into and out of parking spots all traffic will move faster. This is the sanest option if people will just get past their prejudices. I actually quite like this design, especially the part where the parked cars serve as a buffer. The bike lanes look nice and wide, and the extra buffer is appreciated. My only concern is how will it be plowed and maintained if there are parked cars between the main lanes and the bike lane. Bollards on the side without parking would be appreciated and easy enough to add. The bigger question is: why did staff spend a ton of money designing and consulting about the previous design only to scrap it? Toronto could build lanes much more cheaply if everything wasn't studied to death. How about having a few options on the table so that all of the work isn't wasted when the first plan turns out to be not as good an idea as first thought? Maybe do the traffic study earlier in the process? I think you need to look at the new design again. The only "buffer" parked cars serve is between the bike lane and the curb. There is no extra protection here. This is barely an improvement. Why must there still be street parking? Especially, if there is off-street parking available. All parking should first be pay parking, no more free parking, allocating that space to bicycle lanes or paths. There is a definite improvement here: Bike lanes the entire way between Bathurst and Spadina. For me, the jury is still out on protected bike lanes and these new wider bike lanes with painted buffer. The protected lanes on Sherbourne box you in quite a bit, but that hasn't been too big a problem in practice. Meanwhile, the wider lanes on Wellesley are being taken as permission to park, even more so than with the previous narrow bike lanes. That is going to be a huge problem on the no-parking side of Harbord! Data from Toronto and Vancouver show protected bike lanes are between 2x-50x safer than roads with parked cars. Painted Bike lanes or "sharrows" might have a tiny effect, but not statistically significant. Parked cars, local vs. arterial streets, and cycle tracks make a difference. Paint is just paint, apparently. Here in Vancouver, parking buffered bike lanes are great and now found in several places around town. There hasn't been any opposition to them, they're cheap to do as it's just repainting the surface, and they're nice to ride in. They can also be upgraded at a later date if needed with an inexpensive poured concrete curb. After all the enormous subsidy that car culture receives, I have no sympathy for motorists' desires for free parking but they do represent a political force that gets in the way so anything to appease them sometimes is good.